Application management is the centre piece of the Kumolus platform. Unlike any other CMP on the market we can visualise, translate and copy any running network and application stack in the Cloud across Account, region and / or Cloud provider. Kumolus Cloud automation and orchestration featurs helps you to provision, deploy or start servers, deploy and manage network resources, acquire and assign storage capacity, create container services, database resources and analytics capabilities. either directly via API services or using our Cloud drag and drop visualisation editing engine. Deploy full stack applications services with just a few clicks, fully costed and budget controlled. Kumolus provides a foundation to diagrammatically develop complex cloud template patterns and coordinate multiple automated activities to streamline Cloud delivery with assurance and without fear of cost blowout. Utilising granular cloud and network object revision control Kumolus delivers a powerful “Infrastructure as Code” solution for Cloud and DevOps teams ultimately resulting in a consolidated process or workflows for the organisation. Building a cloud environment involves many steps, including documenting system designs, setting up networks, selecting and sizing compute and database resources, assigning storage, defining access permissions, and understanding the cost. Through the Kumolus CMP, you can design environments based on a standardised set of cloud resources, review the forecast costs and then when ready press provision; within minutes you will have an operating environment running with your cloud provider. Within minutes visualise all elements of your existing Cloud environments including Compute, VPC, AZ, Load Balancers, Gateway, Subnet and Subnet Groups, Database and Storage plus more. 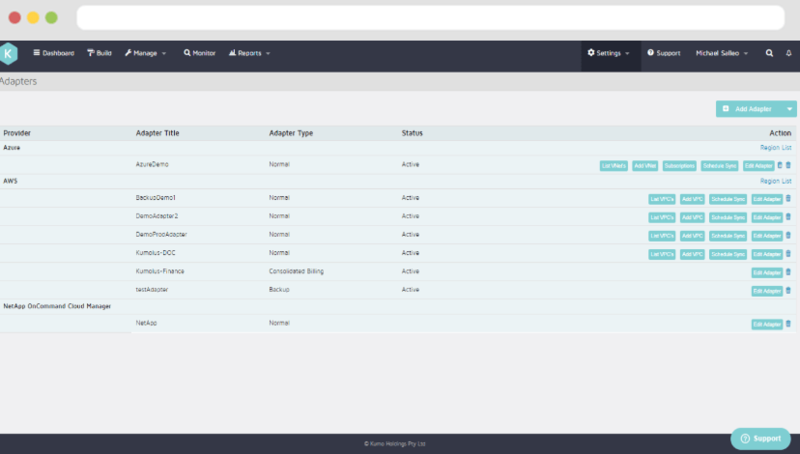 Automatically map full stack application environments, and generate complete configuration details for all devices. Instantly created templates and patterns and identify cost optimisation targets. Version control is the foundation of the entire DevOps delivery process and Kumolus delivers granular versioning of complex Cloud and network applications landscapes acting as the single source truth for infrastructure “as code” within the delivery tool chain. Kumolus provides powerful Tagging capabilities for new and existing “brown fields” environments to enable your teams to manage revision of complex application assets flowing into a release workflow. Understanding the Cloud Network Fabric that underpins a complex application is a core strength of the Kumolus platform. 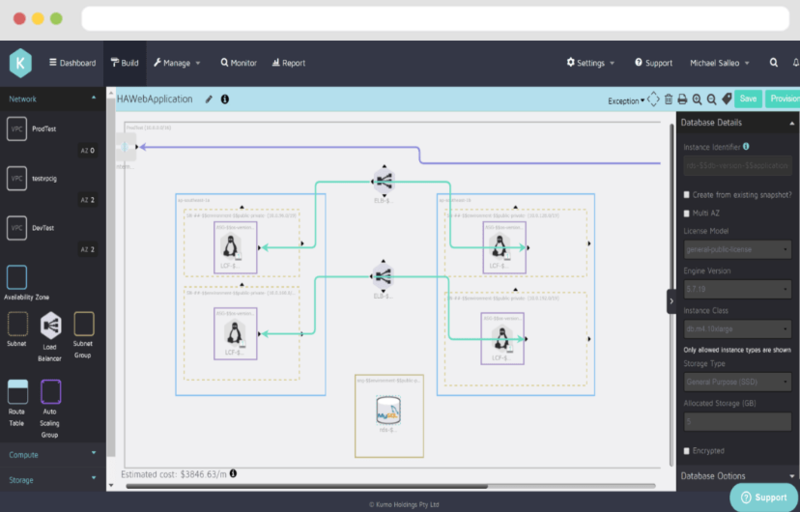 Dynamically visualise your Cloud network fabric including VPC, VNET, NIC, Route table, Security Group and every detail associated with your full application stack. Within minutes Kumolus allows you to template the application and dynamically translate the full Application network stack to a new Account, to a new Region, promote through the DevOps life-cycle and / or to a new Cloud provider. Easily map your applications and workloads to AWS or Azure by Region, by VNET or VPC, Auto sync or set synchronisation schedules. Enable your teams to deploy on the right Cloud provider at the right time or automatically change provider based on requirement. With the agility of cloud comes the ability for rapid change; static IT environment diagrams and ‘as built’ documentation are no longer adequate. The Kumolus discovery engine provides a ‘real-time’ up to date view of your IT environments and service configurations exportable as PDF or automatically injected into Change Management systems. 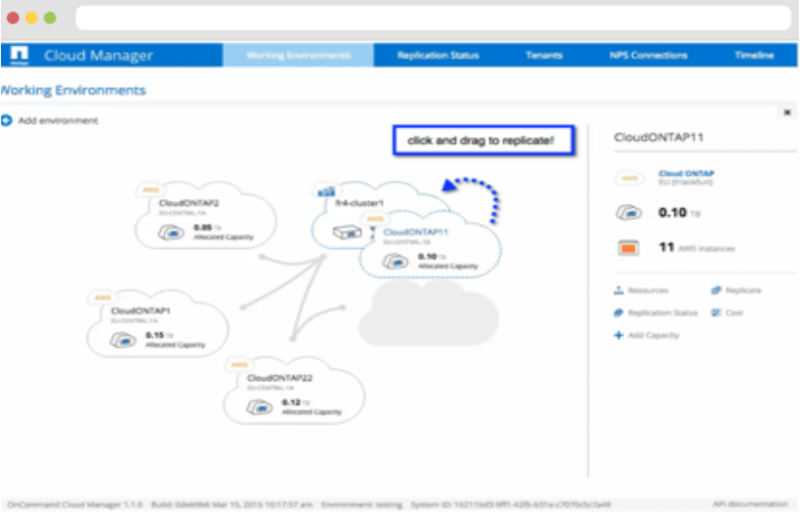 Perform full stack orchestration and automation with NetApp NPS or ONTAP Cloud NFS, CIFS and iSCSI storage. This allows users to orchestrate the provision of NPS or ONTAP Cloud Storage on AWS or Azure via the Kumolus ‘drag & drop’ or API platform interfaces.